Arrange oven rack to highest level (making sure your cast iron skillet will fit.) Place cast iron skillet on the stove and heat on high for 10 minutes. In a separate pan, heat olive oil and saute garlic for 60 seconds or until fragrant. Spread olive oil/garlic mixture onto prepared dough. 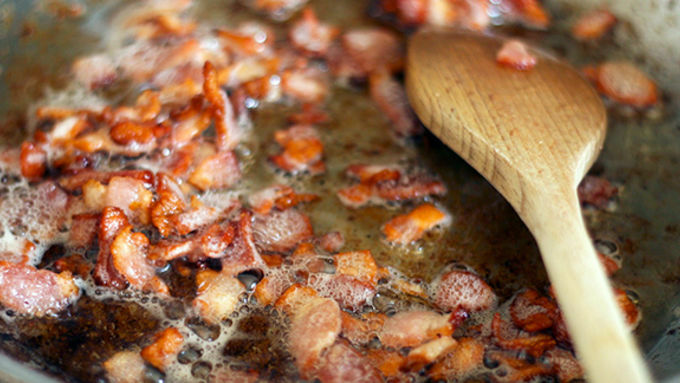 In same pan used to cook the garlic, fry bacon pieces until cooked through and crispy. Remove and drain on paper towels, leaving bacon grease in the pan. 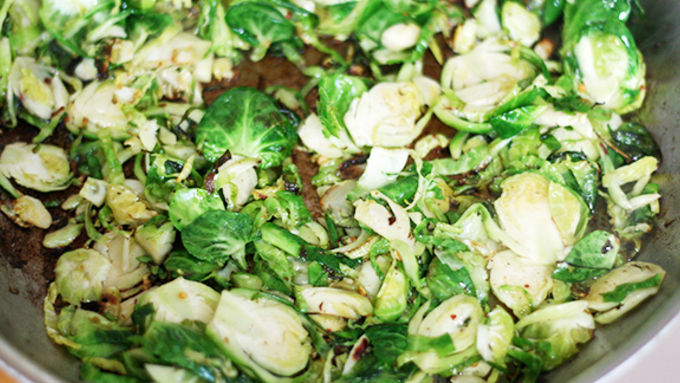 Add Brussels sprouts to the pan and fry until slightly tender and charred in places. Season with a pinch or two of red pepper flakes. Remove from pan and drain on paper towels. 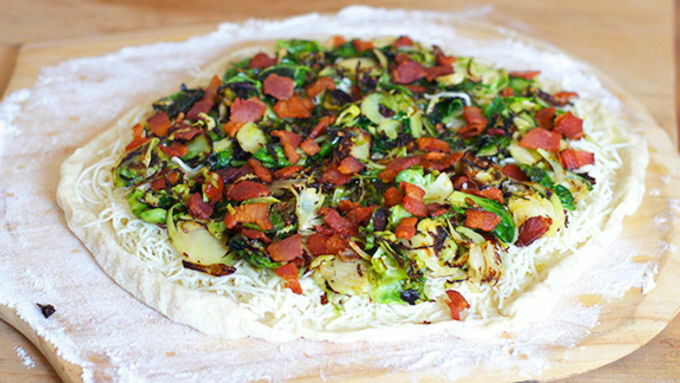 Sprinkle dough with shredded cheese, and top with Brussels sprouts and bacon. 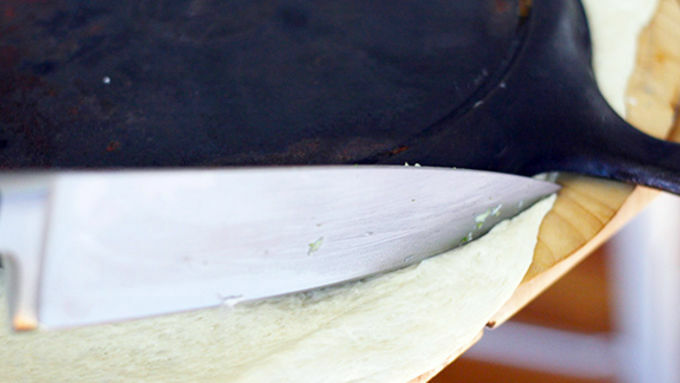 Once cast iron skillet is ready, carefully slide prepared pizza onto the skillet. Allow it to cook for 60 seconds, and then using pot holders, transfer to the pre-heated oven under the broiler. Allow to cook for 60 seconds, and then rotate 180°F and cook another minute. Remove from oven and allow to cool for a minute or two. Slice and serve immediately! When the moon hits your eye like a big pizza pie ... that’s amore! You’ll especially be in love with this new pizza method inspired by How Sweet It Is when you find out it will only take THREE minutes to cook and you don’t need a pizza stone. How cool is that?! 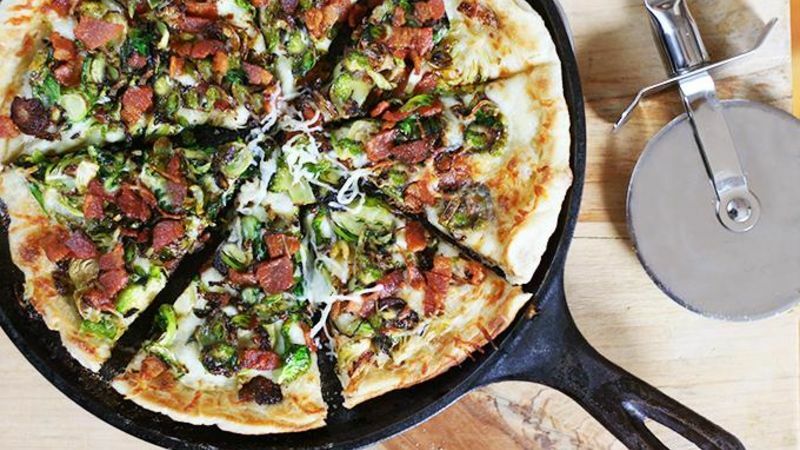 All you need is a cast iron skillet, some pizza dough, and whatever pizza ingredients your little heart desires. I went with Brussels sprouts, bacon and cheese – lots of cheese. For the dough, you can go homemade if you’re feeling ambitious, but the theme of this meal is fast and easy so I went with Pillsbury’s thin pizza crust. The best part? That sound the tube makes when you bust it open. 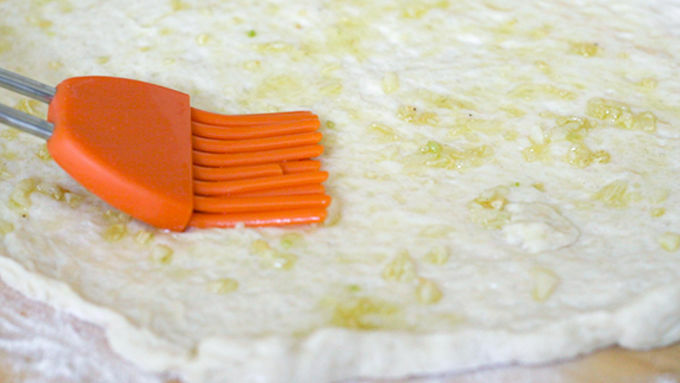 Even though it’s rectangular shaped in the tube, you can easily make it work for a round pizza by trimming the corners or folding them under and re-shaping. Before heating my skillet, I flipped it upside down and just cut around it with a knife. Be sure to leave yourself some extra room on the edges depending on how deep your skillet is. 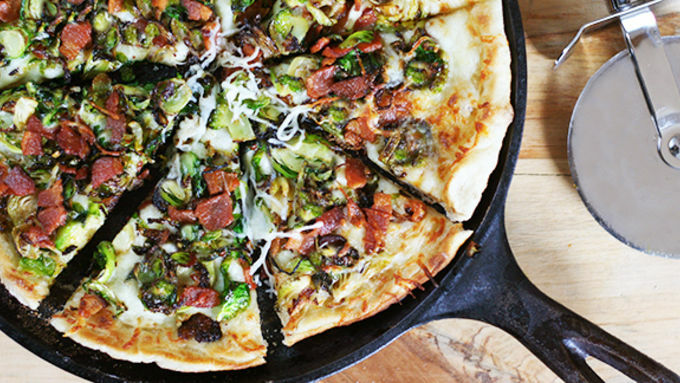 It’s easiest to make this pizza on a WELL FLOURED pizza peel so it will easily slide off onto the hot cast iron skillet. But if you don’t have a peel, you could try using a wood cutting board ... just be verrrry careful when transferring to the hot pan. Speaking of which, you want the cast iron skillet HOT HOT HOT. 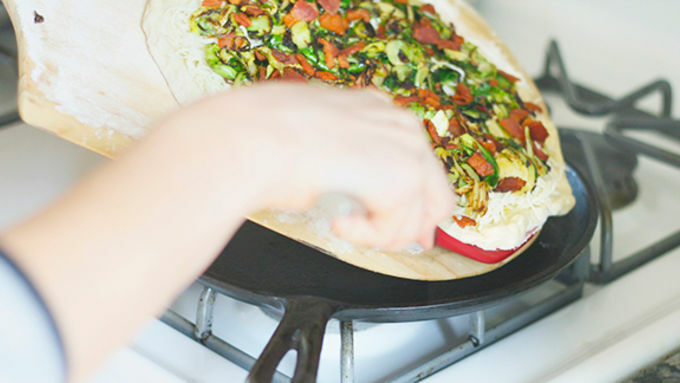 While you’re assembling your pizza, you can pre-heat on the stove at its highest setting. It might start to smoke a little. That’s OK. If it’s smoking too much, turn it down slightly. You’ll also want your oven rack at the highest possible position with the broiler on high. Slice, serve and enjoy! Pizza. In three minutes flat. And consumed just as quickly. Bon appetit!